You can book regular courses online with an online payment. Or, contact us by email (training@timetomarket.co.uk) or telephone, and we will email either a training proposal or a confirmation of booking and fee payment details to you. PresentPerfect courses–the course fee covers as a minimum: tuition, course notes, lunches and daytime refreshments for the duration of the course or coaching session. We will confirm your booking when we receive a purchase order, booking deposit or full payment, in accordance with the Terms and Conditions below. Online. We will include a link in our email. Cheque: Payable to “Time to Market Ltd” in pounds sterling. Please mail to Time to Market Ltd, Sandford Gate, East Point Business Park, Oxford, Oxfordshire, OX4 6LB. BACS: You may pay using BACS: Bank of Scotland, 600 Gorgie Road, Edinburgh, EH11 3XP, UK account name: Time to Market Ltd. We will provide a VAT invoice before you attend the training or coaching session. Please quote the invoice number with all correspondence and payments. Valued Added Tax (VAT) is applicable on all presentation training course and coaching fees. Our VAT Number is GB793507696. We require payment of fees, due to Time to Market Ltd, in full before each course. You can make your payments using one of the ‘Payment methods’ described above. If for any reason, a course is cancelled then Time to Market Ltd will make every reasonable effort to give course participants as much notice as possible (normally at least 10 working days prior to the course start date). Time to Market Ltd's maximum liability will be limited to a refund of all course fees paid or owing at that time. The Company will not accept liability for any costs or losses incurred by participants or organisations which are claimed to have arisen through course cancellation, other than for those stated above. We reserve the right to vary arrangements for its courses, such as venue, trainer etc, and in such cases will make all reasonable efforts to inform delegates in advance. If notice of cancellation is received with fewer than 3 working days before the course start date a refund of fees paid or owing will not be arranged–in these circumstances we aim to postpone your event to another mutually agreed date. Any registered participant who cannot attend a course may be replaced by a substitute participant at any time before the course. Please contact us in advance giving full details of the substitute who will attend in their place. The same terms and conditions will apply to the replacement participant. Substituting in this manner will normally avoid incurring cancellation fees. Time to Market Ltd reserves the right to vary these Terms and Conditions from time to time and the current version will be that published on our website. 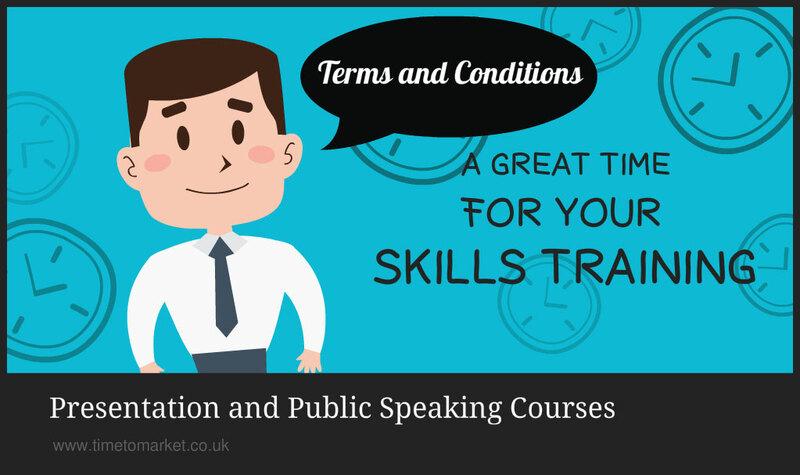 Through registering for a course participants are deemed to have accepted the Terms and Conditions.